Unilever’s popular ice cream brand Cornetto, from their Kwality Wall's portfolio, targets the youth demographic. 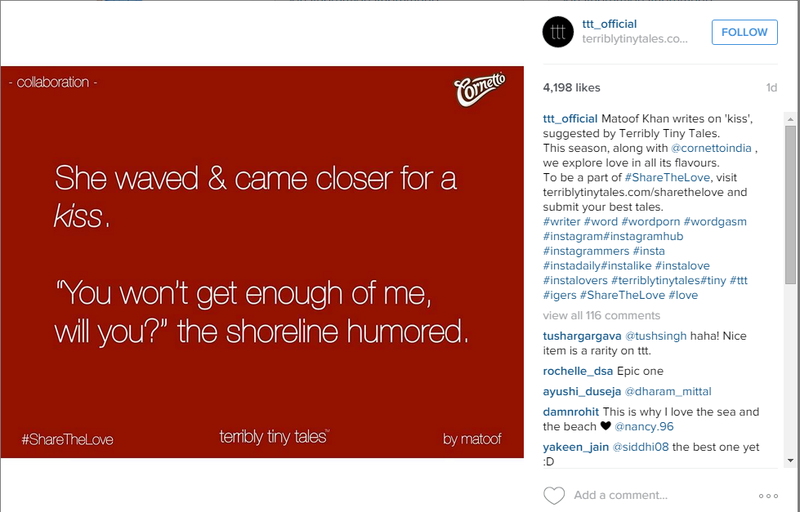 Little wonder then that the brand decided to collaborate with Terribly Tiny Tales (TTT) a social storytelling platform that creates and crowd sources 140 character ‘tweet’ stories. TTT – a ‘built for social’ concept - has a large youth fan base across Facebook (394k), Instagram (55k+) and Twitter (4k+) - though I believe that the fun format with simple photo story jpegs works really well for Instagram (more than the other social media platforms). I discovered the campaign on Instagram as well! Cornetto’s brand premise hinges on romance, remember the Cornetto Cupidity Tales on YouTube? In the same vein, TTT posts a loved-up tiny tale every few days. The posts stand out with discreet branding and (not so discreet) red background color. This is an inherently unique and viral concept. Absolute win for both Cornetto and TTT!